On May 1, 2016, abolitionists assembled outside the walls of First Baptist Church, Blanchard, OK to reach out to the congregation directly. Other means of beseeching the church to act Christian and to repent of their involvement with child sacrifice had failed. 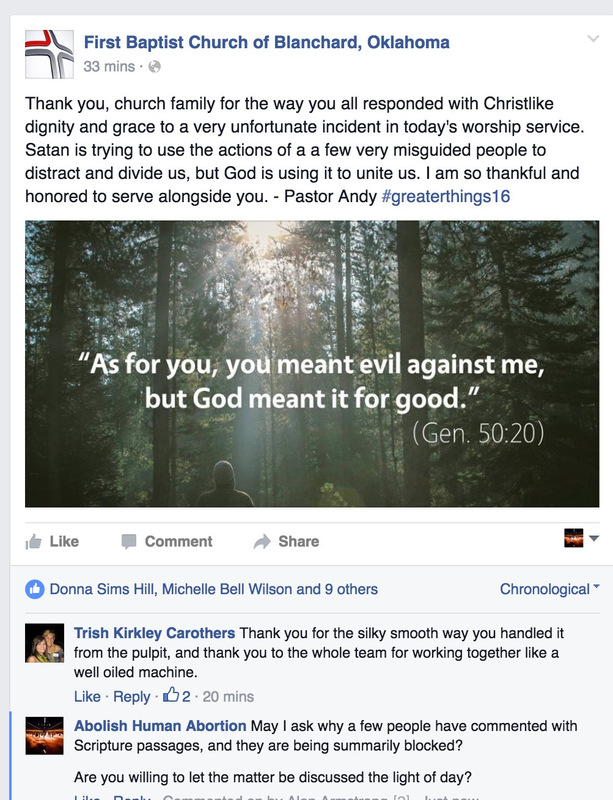 Rebuking the leadership in public view was the best, biblical, and only means of obeying Scriptural commands such as Ephesians 5:11 and 1 Timothy 5:19-20 while simultaneously agitating the congregation at large to do the right thing – investigate, ask questions, and call their leaders to account. As mentioned in the video, four abolitionists entered the church and attempted to distributed flyers to attendees during the time in the service when everyone rises to shake hands and greet one another. The security team was obviously well-prepared and on the lookout for any strange activity, for within 30 seconds, all four were detected and escorted out. Two of them were bodily pushed in a violent way by these Christian folks in small-town Oklahoma (video one), and a man who identified himself as a deacon proceeded to lecture one of the two in ways that were considerably unfaithful to the Scripture (video two). These abolitionists did not disrupt the service and did not resist the expulsion, but instead immediately left the property by car. First Baptist called the police even though no illegal act had been committed. We were told later that their accusation was of harassment and stalking, though those four had never even been to Blanchard, OK before, let alone on church property, and no other abolitionist set foot on the property. Blanchard police attempted to discourage (via threats of arrest) these and other abolitionists from standing on public property across the street from the church property, but, undeterred (and with the First Amendment on our side), we proceeded with our plan. Though we were unable to distribute many flyers, we held relevant signs exhorting the church to repent, and we engaged in open-air preaching via megaphone. Dozens of people stood on the front patio of the building, >100 yards away, to listen to the preaching. After ~20 minutes of preaching, Andy Finch, senior pastor of FBC Blanchard, approached, flanked by two Blanchard police officers as though they were his honor guard. He did not deign to cross the street to speak to the abolitionists but rather sent an officer across to ask if one of the abolitionists would speak with him – the same abolitionist who weeks before had twice offered to meet with him face-to-face despite being rudely rebuffed. Finch’s sole demand was that no recording devices be used. No amount of exhorting him to act upright and godly sufficed. See here the encounter. –Abolitionists are misguided and being used by Satan to distract and divide. –We misrepresent Christ, slander the church, and harass the members. By quoting Bible verses on their previous post. This is evidence of a church agitated. We know other members were asking questions. We know that one attendee said that the church was “embarrassed”. We know that another said, even before May 1, that we were “distracting” the church (presumably from sending youth to False Conversion Creek or having burger cookouts). The security team was ready for us, as mentioned before. This has not been smooth sailing for FBC Blanchard. But the plot thickens. 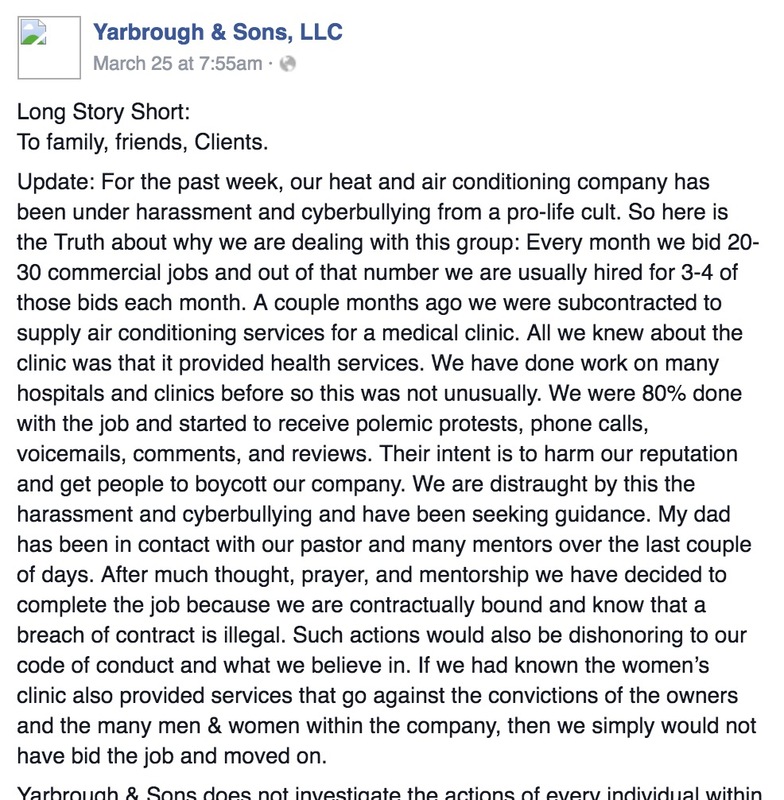 Yarbrough & Sons, as documented here, on March 25, 2016 had doubled down in their vocal defense of completing their contractual obligations at the new South Wind Child Sacrifice Women’s Center (screenshot one) (screenshot two). As of May 1, however, the post had been taken down, expunged from public view. In its place is a different statement from FBC Blanchard, telling a very different story. 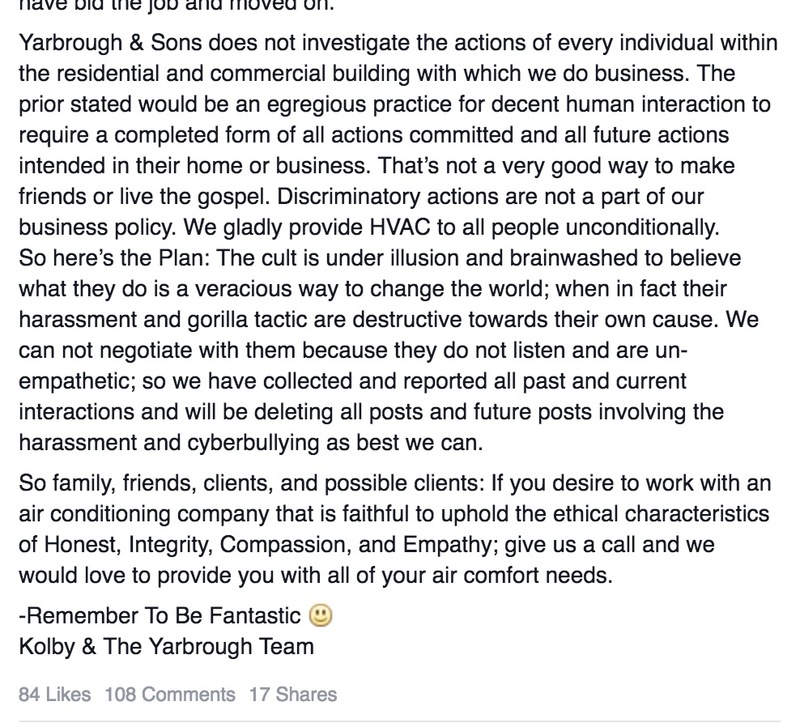 Yarbrough & Sons’ own Facebook account joined in the deception with their own post a few days later. 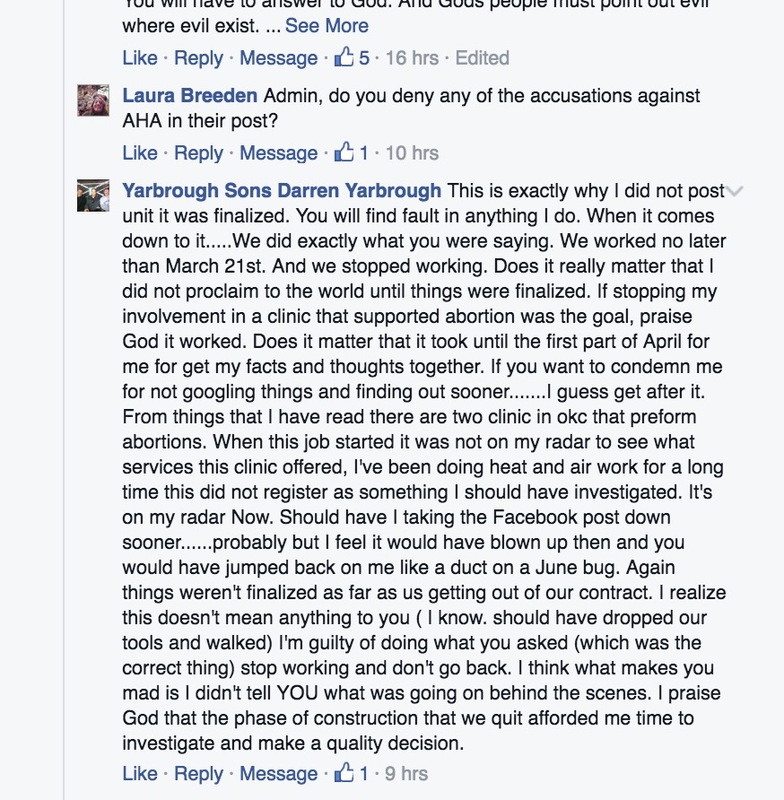 Further, what appears to be one of Darren Yarbrough’s personal accounts left a similar statement on the Abolish Human Abortion Facebook wall (screenshot one) and then again on a different thread. And then Yarbrough appeared with a variation on the theme on the original YouTube video that exposed his duplicity (screenshot). The theme is: Yarbrough & Sons actually did do what abolitionists asked – walk off the job without finishing. This is the story that they’ve been repeating since May 1 – both Pastor Finch and the deacon who threw the abolitionist out of the First Baptist building said as much. Yet between March 25 and May 1, their claim and firm stance has been: We will complete the job because we have integrity and we stick to our word. That said, we are very glad to see that Yarbrough & Sons wants to talk now. The problem is the timing and the way that Y&S and First Baptist Blanchard have been speaking and acting up until abolitionists exhorted FBC Blanchard in person, thus agitating them in a very visible way. 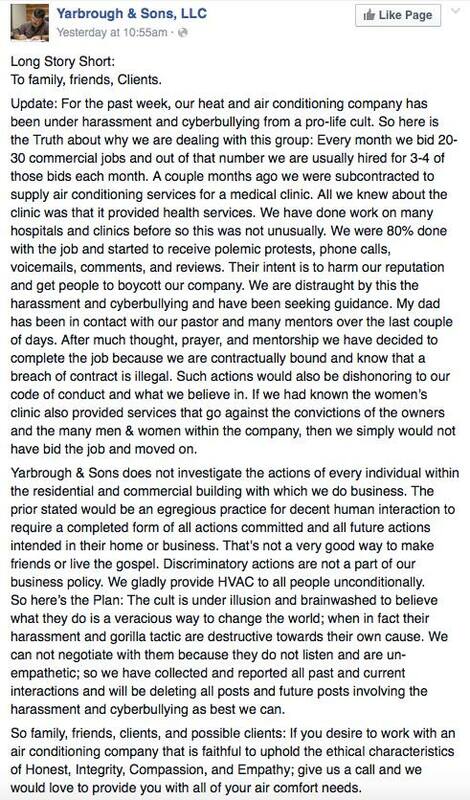 The current statement from Yarborough and Sons is completely contrary to their prior prideful doubling down in their resolve to finish the job, in which they stated that after much prayer and counsel from Pastor Andy Finch, it was because of their convictions that they must finish the job. Now all of a sudden, Finch didn’t counsel them to finish the job, and it’s because of their pro-life convictions that they supposedly walked off the job (the job of which they were 80% finished with 3 weeks before they supposedly walked off. 3 weeks sounds like enough time to finish the last 20%). Further, it was only after abolitionists showed up at their church meeting place to exhort them to repentance that Pastor Finch came forth with the information that Yarbrough had walked off the job. He insisted we turn off the camera before he would tell us. Then the next day, Yarbrough and Sons makes a public statement, sends us an email, and First Baptist Blanchard makes a statement on their FB page about it. Why would Finch want to tell us that information only off-camera and only after we showed up at his church building? Why then, the next day, did they all of a sudden make several very public statements about not finishing the job? Why also have they not repented of all the slanderous things they said about Abolitionists (and in fact continue to repeat them) as well as all of the other sinful things they said in defending their actions of continuing the work? Seems like damage control to those involved first hand with all of this. It seems very convenient that all of a sudden when abolitionists show up to their church meeting that “oh, no, he walked off the job” [so there is no need to come back now] became the party line. you showing up on the site and professing our sins and putting them on you tube for all the world to see was the first i had heard of this. This is an enormous lie and shows that Yarbrough has mixed up his fake imaginary timeline. Alan Maricle called on 17 March and informed the Y&S receptionist (who has not apologised to Maricle, by the way, for her unprofessional and rude treatment of him) about this. Then another abolitionist informed Yarbrough in person of this matter a few hours later on the same day. 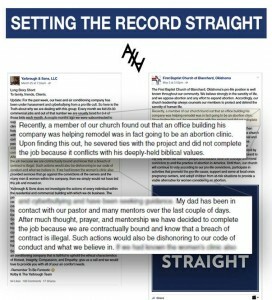 Yarbrough’s sin was not exposed online until days after he refused to walk off the job and made it clear on the phone that he would not walk off the job. And now Yarbrough wants credit for walking off the job. Dear reader, check for yourself – the very first article about this matter and its accompanying video were both published on 22 March, five days after being told they were building a child sacrifice center; Yarbrough & Sons had five days to turn away from this obvious evil behavior before they were exposed This false timeline does not stand up to scrutiny. More lies, with more false timeline, are seen on this post by Yarbrough & Sons, published on May 6. 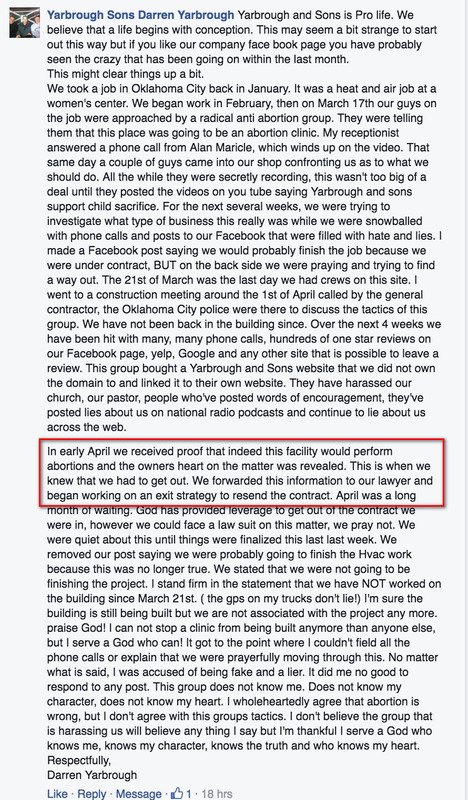 Notice the highlighted portion – the claim is that “(i)n early April we received proof that indeed this facility would perform abortions”. They had access to that information on March 17! Their claim that “April was a long month of waiting”, along with the claim that March 21 was their last day of work on the job, collapses when one considers that their trucks were seen at the facility well after March 21. 1) Why are you posting this now, when you have had over a month to say something? 2) Why did you tell a Christian brother (Alan) to talk to your attorney instead of fulfilling the offer that you yourself made to him, to meet with him in person? 3) Why did you take the job in the first place, when Andy Finch said opn May 1, 2016 that you knew what the project was from the beginning and that he advised against your taking it (which is, by the way, contrary to your assertion in this screenshot and on the phone with Alan that your pastor supported your finishing the project)? 4) Why did you treat brother Chris (and his brother who accompanied him), who bodily came to your office, so sinfully? Don’t you think you should apologise to him for expelling him from your property when he was there to show you love? 5) Have you asked the Y&S receptionist who first took Alan’s call to apologise to him for her rude and unprofessional treatment of a brother in Christ? 6) Why is it that you were on vacation the day that I called, but then when Chris showed up a couple of hours later, you were magically present in the office? 7) Why did you post on Facebook that you were proud to have delivered the service that you delivered? 8) Why are those Facebook posts removed now, given that you repeatedly stated that you were proud of the service you rendered with integrity? 9) How is it that you were promising to finish the job because you believe in integrity and honesty and all that, but now you’re telling everyone that when you posted that, you had actually STOPPED work on that facility? 10) Why were Y&S trucks seen at the facility at least twice after 21 March? 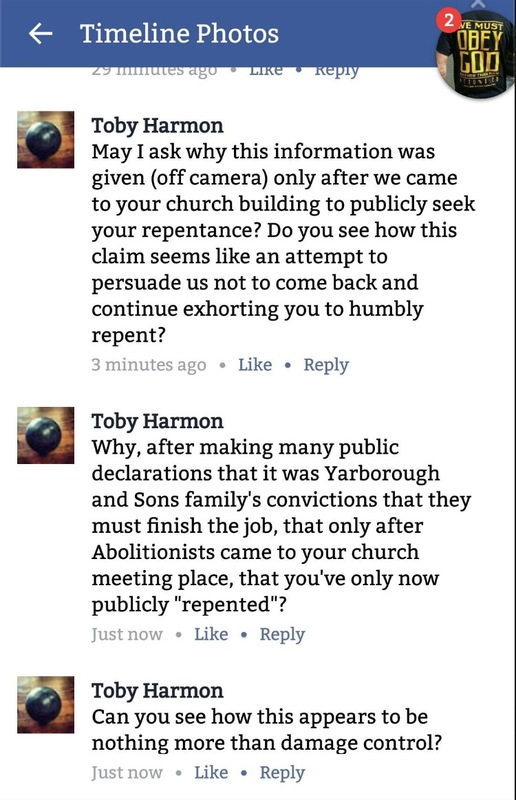 11) Why were you personally seen on the premises after 21 March, and when confronted by Toby’s preaching, why did you go inside the building? 12) On what basis and according to what evidence did you label abolitionists a “cult”? 13) Why did you think in such a shallow way about the contacts you were receiving, such that you grouped all of us together under the “AHA group” banner? Are you even aware that AHA is not an organisation? Did you even listen to the concerns of the people to understand that many of the callers and commenters don’t call themselves abolitionists at all? 14) Your most recent cover-your-rear status implies that you immediately stopped work on the facility when you were told what it would become. Yet you were told on 17 March what it would be and you didn’t stop until 21 March (by your own admission), and above in this thread you said that it took a while for you to realise what the right thing to do was. Can you see how this is misleading? 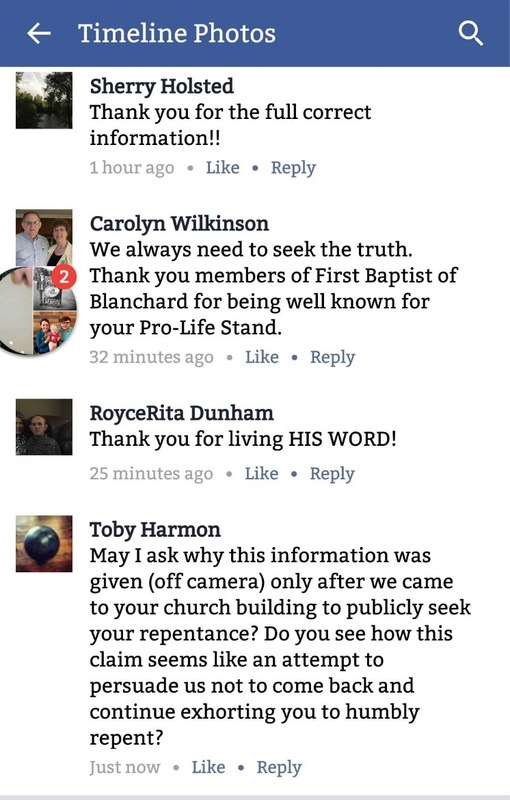 15) Why have the Facebook pages of both Yarbrough & Sons and First Baptist Blanchard, as well as your own personal statements, emphasized the fact that you are pro-life, as if anyone ever contended otherwise? 16) You wonder whether it matters that you didn’t announce publicly to the world that you were walking off the job. Are you obligated, as a follower of Jesus, to make a public stand for Jesus and for righteousness, or do you think that hiding light under a bushel is the right way to go? Yes, it most certainly does. Darren and Andy are in a position of leadership in their church and people look to them as examples. Darren is on record saying he loves money more than righteousness. His repentance ought to be public. He said: “I feel it would have blown up then and you would have jumped back on me like a duct on a June bug” — this is false. Darren can make all of this go away. Let him obey Jesus Christ and repent publicly of what he has done. Let him stop trying to spin out damage control. Let him be Christian. Yet he didn’t have to google anything. All he had to do was listen with a Christ-like ear to brothers who came to him in love to warn him. Instead, he threw us off his property, made false accusations publicly, and told abolitionists to talk to his attorney while he gave their information to the police. Will he repent of these actions? It is false that we are a cult, or brainwashed, or harassing, or cyberbullying, or whatever else the leadership of FBC Blanchard and Y&S has asserted. It is false that we would find fault in anything they could do, as if we had a vendetta against them and just wanted to harm their reputation or initiate some sort of boycott. It is false that the important thing was telling US that they were walking off the job. The important thing was telling EVERYONE. It is false that we claim that Y&S are still building the death mill. Rather, they seem to have finished whatever they were working on sometime in April, given that their trucks were seen there during that month. It is false that anyone disrupted FBC Blanchard’s church service. Why does he continue to lie about this? It is false that he couldn’t stop the place from being constructed. When notified, he could have materially hindered the project, as a matter of fact. But he chose to continue moving forward. It is false that any abolitionist has slandered FBC Blanchard. A necessary element of slander is that it is false. Rather, ironically, false accusations of slander are themselves slander. It is false that any abolitionist left combative or dishonest or shameful comments on FBC Blanchard’s Facebook page. Rather, we asked questions (example one) (example two) (example three) and posted Bible verses, and they choose to lie about us in order to turn people away from the truth. Finally, it is false that only God knows his heart. Jesus said that a tree is known by its fruits (see Matthew 7). Lord, have mercy. Alas, you who are longing for the day of the LORD; for what purpose will the day of the LORD be to you? It will be darkness and not light; as when a man flees from a lion and a bear meets him, or goes home, leans his hand against the wall and a snake bites him. Will not the day of the LORD be darkness instead of light, even gloom with no brightness in it? In the providence of God, an unexpected witness has stepped forward to testify that Yarbrough & Sons, LLC, contrary to the public statements that they began to make on 01 May 2016 that they did not complete the project of renovating the abortuary in OKC, did in fact finish the project rather than walk off the job on 21 March 2016 as they claim.